Ultralight is just the beginning. Hollow pins and hollow plates help keep the weight of KMC's X11 SL 11-speed chain to a minimum (claimed 228g), but impressive performance is where this chain really excels. KMC uses a bushing-less construction and plate chamfering keep your drivetrain running smoothly and provide crisp gear changes. Double X bridge outer plates reduce chain flex especially when shifting under load. Best, of the all the X11 SL includes KMC's 11-speed Missing Link, providing tool-free installation -- no "peening" required. The KMC X11 SL is compatible with Shimano, SRAM, and Campagnolo 11-speed drivetrains. 112 links. 233 grams. Kmcs chains have always been great for me!!! My bike shifts better than ever!!! There are only two reasons to ever suffer through Campy chain ownership and the strange torture that is installation pins and $3,000 chain tools. 1). Campy chains really do last a long time. 2). Some vague belief that nobody else could possibly make a chain that works as well with Campy drivetrains as the Campy themselves. While 1 is still hanging in there (they really do seem to wear well), after trying the KMC X11-SL, I no longer believe 2 at all. While I don't have a direct head-to-head, I can tell you the X11-SL was much, much quieter and smoother than the Campy chain it replaced. The difference was incredible, in fact. Shifts, including some highly ill-timed ones on a ride with about 5500' of elevation gain, have been consistent and smooth. At about 700 miles, the chain has been nothing but great. And the Missing Link is light years better than any replace the pin installation and removal method. Just don't expect the audible click the instructions promise when the two halves engage. Never happened for me, even though the link is definitely engaged. Tested gingerly, could still see a tiny, tiny gap, then rode up a 20% or so grade no gap, locked. Only a lack of miles and a belief that perfection should be rare keeps me from going with the 5-beer on this. Great alternative to Dura Ace. Light. Shifts flawlessly. I've used the 10 spd and the 11 spd versions. This is a super light chain. Quiet for the most part though there is some noise as expected if you are cross-chained in the big ring. Used as a replacement for SRAM chains. I think it is quieter, shifts smoother and is definitely lighter than SRAM chains. Super LInk connector makes it easier to install than Shimano pin on Shimano chains. Prefer traditional silver but KMC has gold and other bling colors as well. Only downside is regular price - wait for a sale to buy. 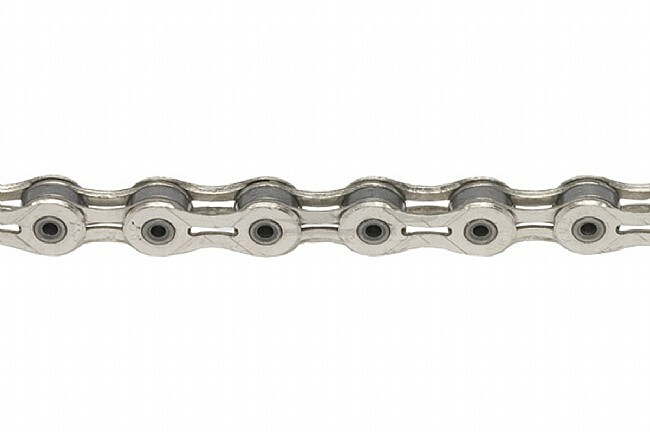 I have several 10spd KMC chains, using them on my road and cross bikes, and they have performed great! Unfortunately I cannot say the same for the 11spd version. I switched out my chain almost immediately using my past experience with KMC as the reason, but I must say I am disappointed at its performance. It is noisy and it actually seems to be rubbing a few of the cogs causing some of the actual cog to be worn off! I'm waiting on pins for my OEM Shimano chain and it is going back on, something I never did with the 10spd chains. I have been using the Campy record chain back for several years, and have had no problems with it except the hassle of installtion for the new 11 speed version. I got the KMC as I got tired of the hassle of installing the campy, even though I had already dropped the dough on the campy tool. The KMC performs identical to the campy and the quick link is a real bonus. I just changed out my first KMC after 4,000 miles.